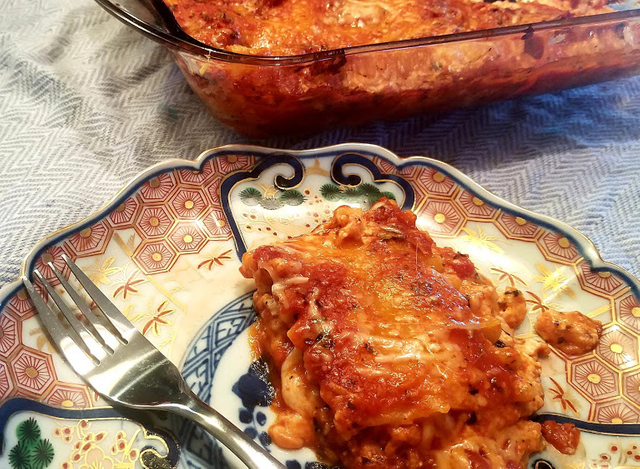 Is there a more universally loved comfort food than the cheesy, warm goodness of lasagna? This classic dish is easy to prepare and a crowd-pleaser. You can use homemade or store bought sauce and noodles, either way, you can’t go wrong with this tasty meal. Preheat oven to 375℉. In a 9x13 inch baking pan, spread a small amount of pasta sauce on the bottom. In a large stockpot, cook lasagna noodles to al dente, per package instructions. Drain and set aside. In the baking pan, place one layer of the noodles. Cut to fit the baking dish as necessary. On top of the noodles, layer half the ricotta thinly, top with a third of the sauce, followed by half the mozzarella. Repeat in the same order: noodles, ricotta, sauce, mozzarella. Place a final layer of pasta, the remainder of the sauce, and evenly sprinkle with parmesan. Bake until golden and bubbling, about 45 minutes. Check on the lasagna frequently after the initial 30 minutes, if the cheese on top begins to turn from golden to brown, cover with foil for the remaining cooking time. Allow lasagna to rest outside the oven for about 5 minutes before serving warm. Thanks, I will make this tonight for my dinner. What is the best pasta for lasagna? Do you have other suggestion? Substituting the lasagna pasta for thick slices of zucchini is a healthy, low carb option that is delicious!